Hi! I’m so happy to share with you my first professional makeover. 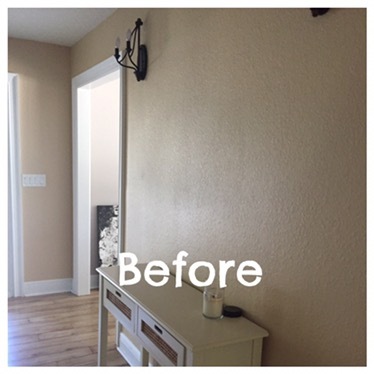 I’ve been doing makeovers for the last two years however this is my first time as JOY in decor Ocala. 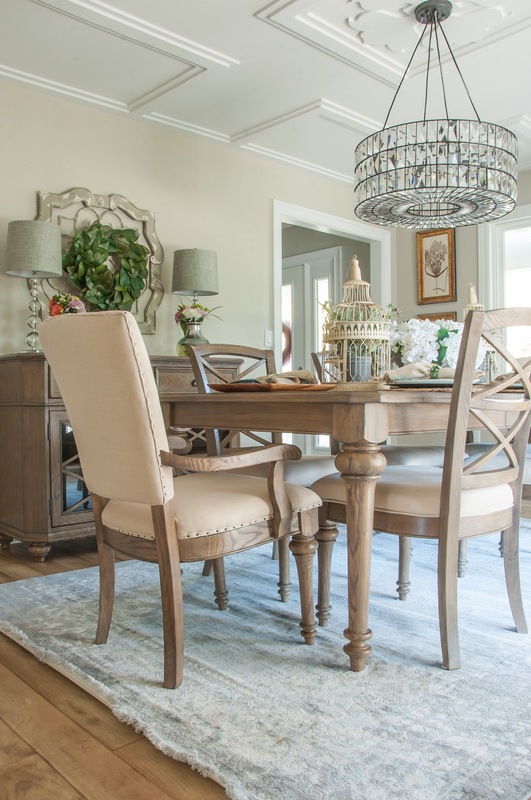 The house is a big beautiful southern home, with gorgeous wood flooring and a white kitchen, basically the dream of most of the Southern homeowners. 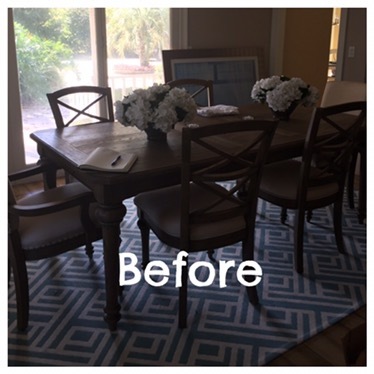 This job was a little challenging because I needed to work with the existing furniture. 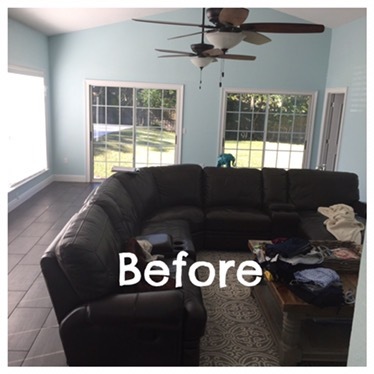 A traditional green sofa/ love seat set and an oversized brown leather sectional were there, so I had to make them work, no matter what. I was convinced that I could make them look amazing. And I did it! 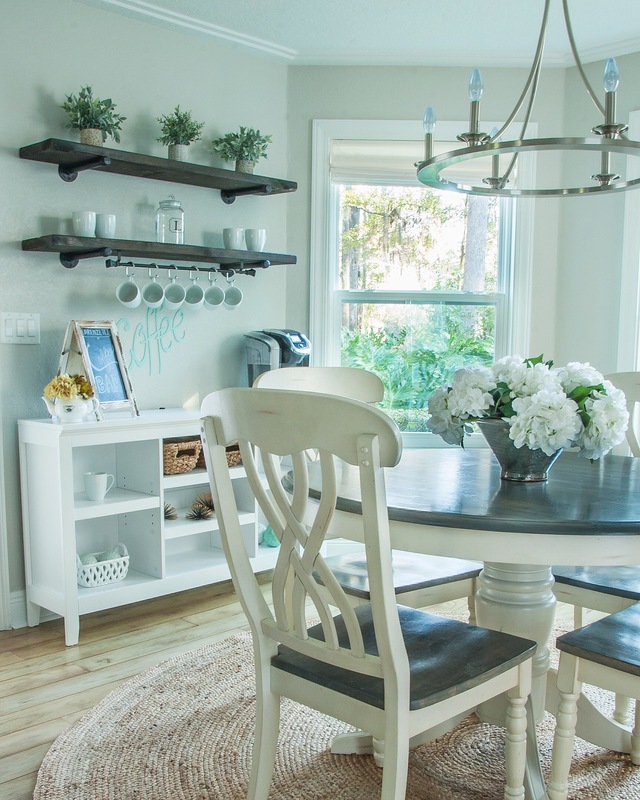 With a lot of thinking and the perfect accessories, I transformed the space not only in a beautiful one but functional. 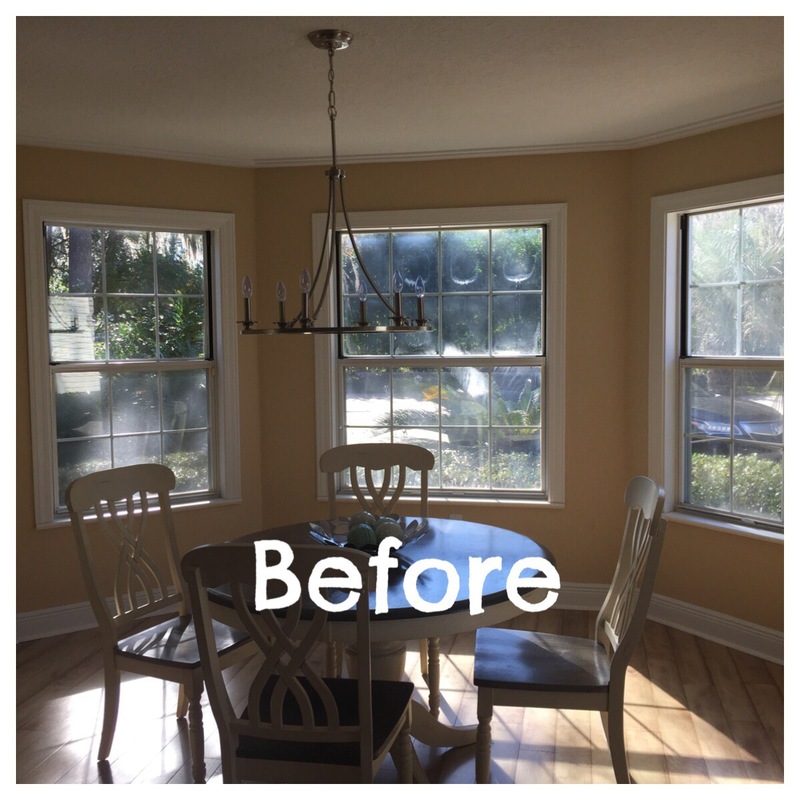 Let’s start with the dining room:before and after. 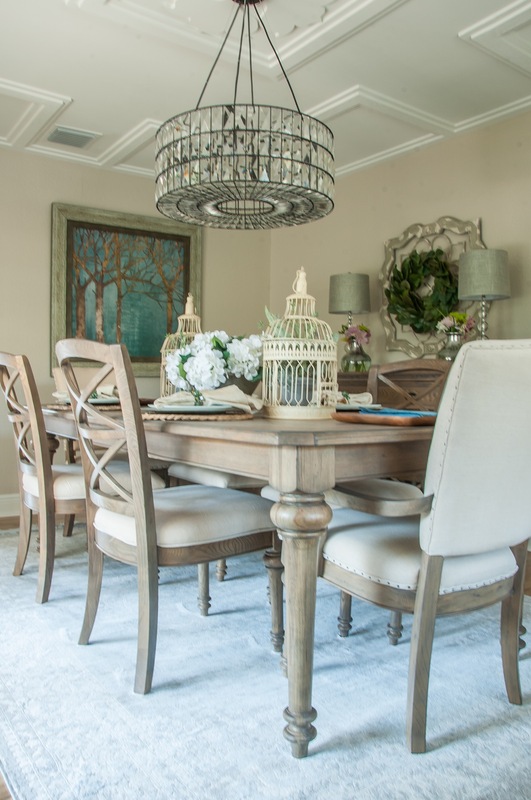 A new vintage rug, wall art and a beautiful tablescape transformed this dining room exactly how I envisioned it. 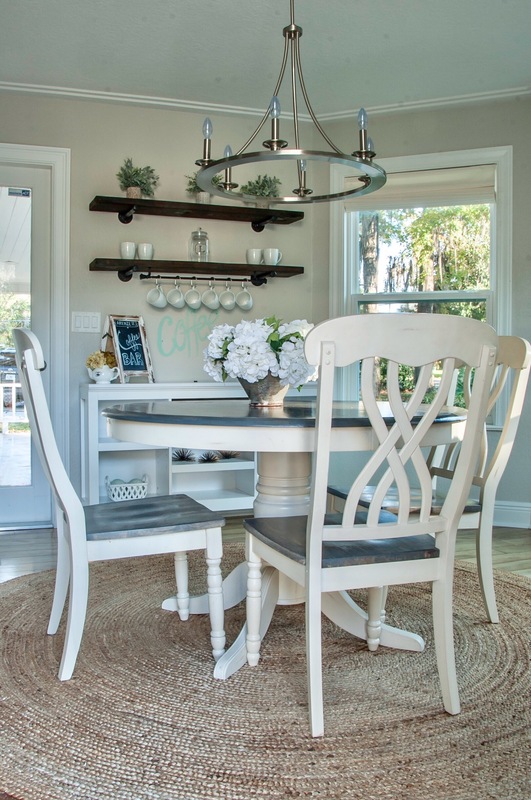 Now, the breakfast nook. 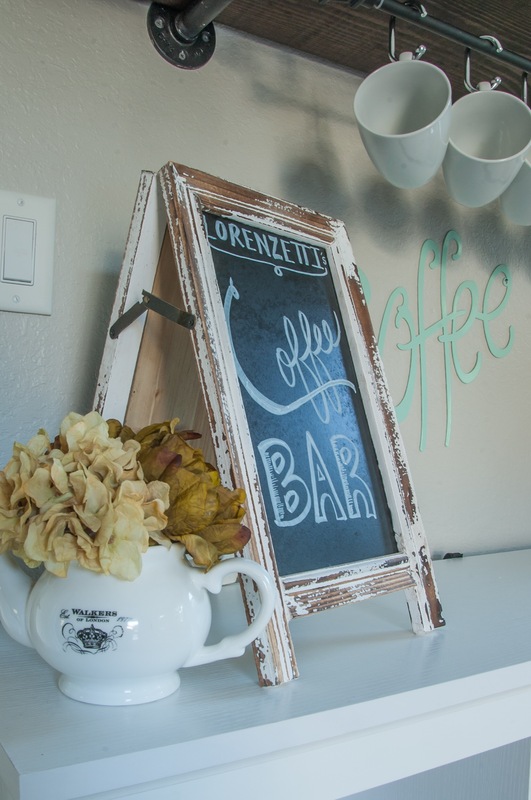 I would say this space came to live because of the coffee bar. I built this industrial shelving out of boards and iron pipes. 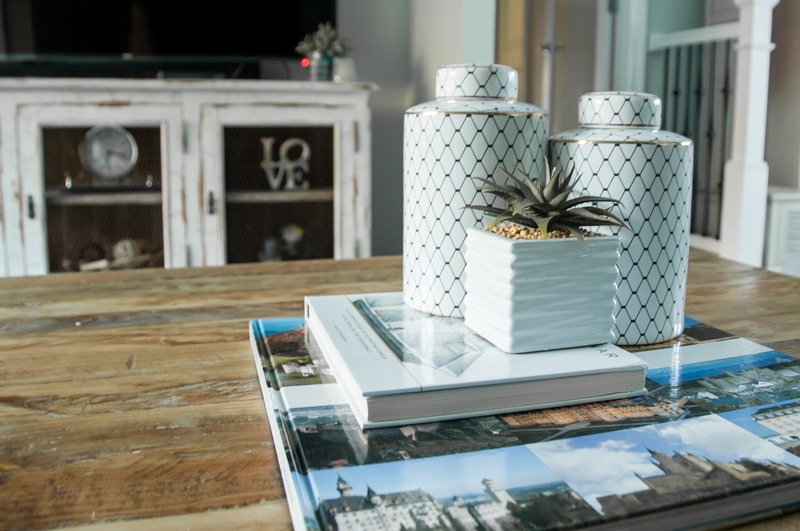 The correct accessories such as a jute rug, hydrangeas, lots of mugs and greenery were key to make it look pretty, interesting and functional. Family room. My client wanted me to work with the existing furniture. 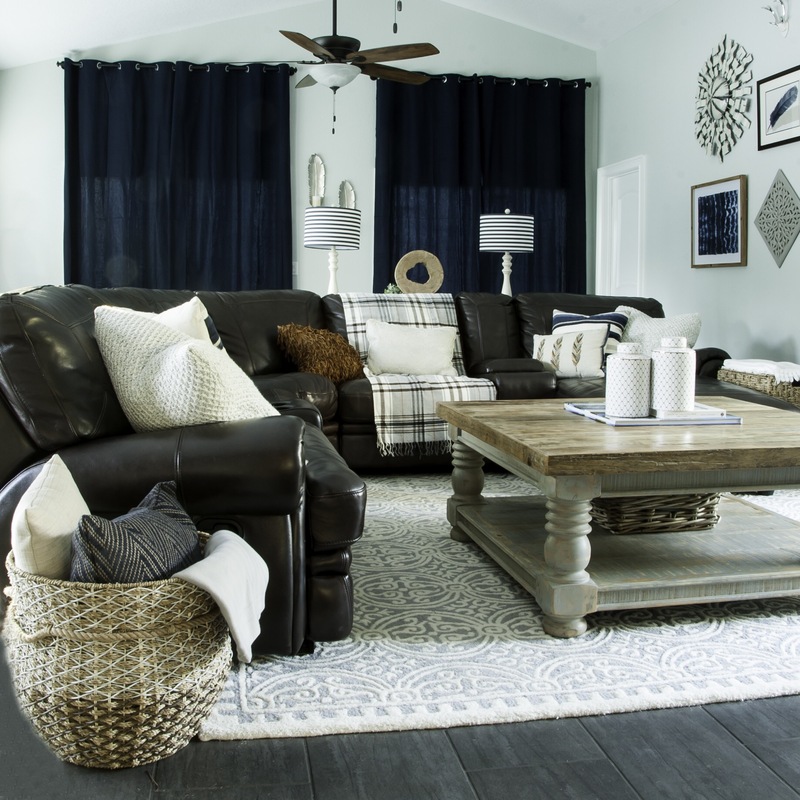 That meant, the brown leather sectional,the rug and the ceiling fans needed to stay. This is the space where the family gathers for watching TV and the kids (two boys) spend most of the time. 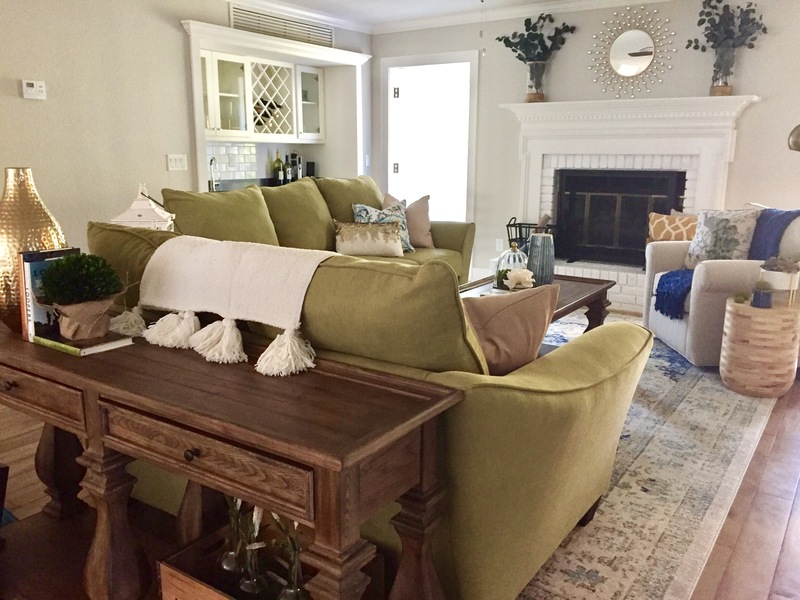 Considering the fact that I needed to work over that furniture, I immediately envisioned the space with lots of pillows and throws transforming it in a cozy, comfortable,laid back area fun to be in. 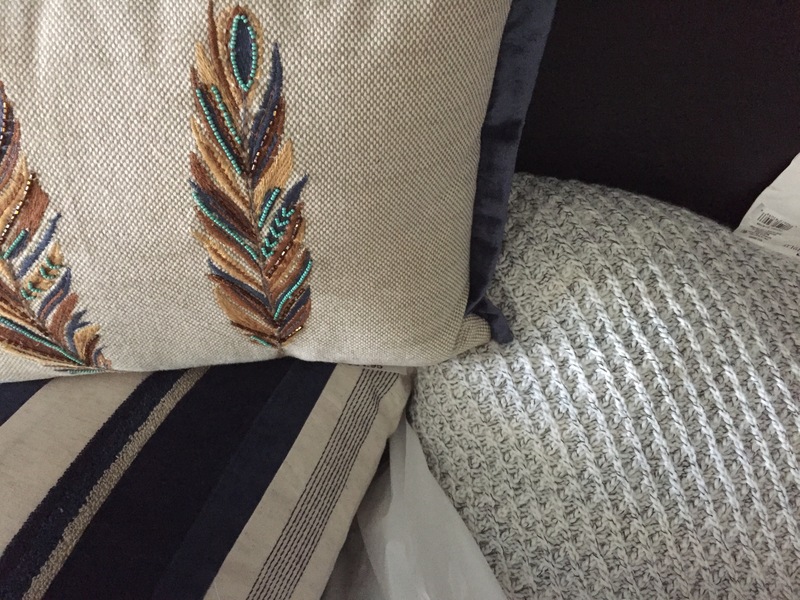 That’s why I chose indigo blue and neutrals as the perfect color palette. The accessories were also carefully chosen to be kid friendly without losing the prettiness. Baskets were added at every corner of the couch allowing more storage space, never a bad idea when you have kids. To control the amount of light entering the space during the afternoons, I chose these beautiful indigo drapes, easy to care, 100% cotton. I hung them properly from the ceiling emphasizing the beautiful high ceilings of the house. 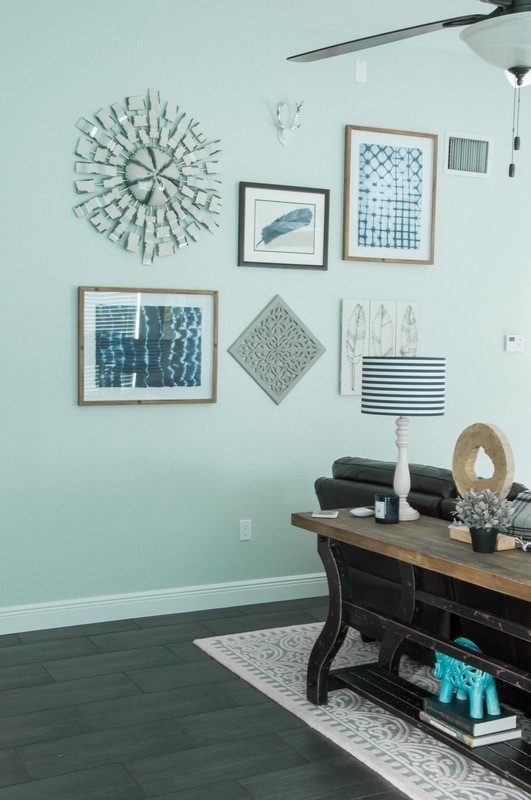 A gallery wall was also built, making the space even more interesting. 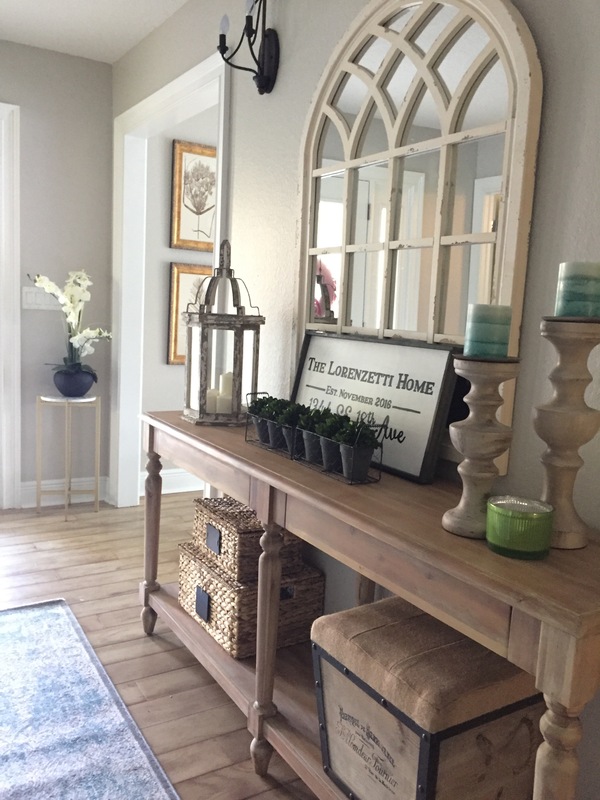 Foyer: I replaced the existing console table for a stylish and more proportioned one. An oversized mirror and accessories were carefully chosen transforming this foyer in a great place for welcoming their guests. 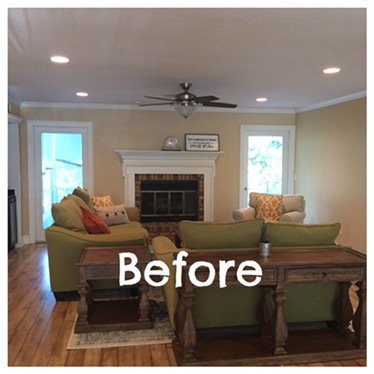 Living room: What an amazing transformation working with existing furniture! The client had this traditional green sofa/love seat set. The budget didn’t allow me to get new furniture or slip covers, however it turned out to be my favorite area to work with. I didn’t try to cover the fact that the furniture was green, my approach was exactly the opposite. I was motivated to make that green to look pretty! Adding blue and gold/brass accesories the space came to live. 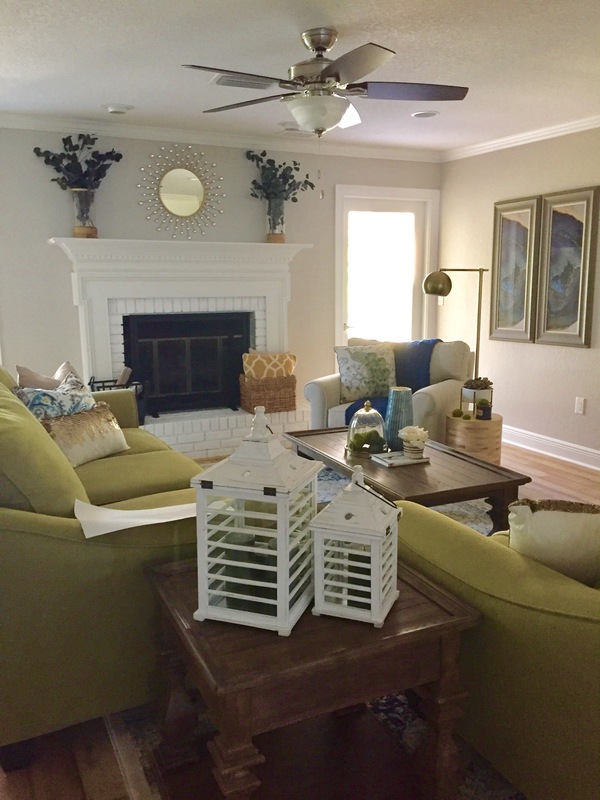 The rustic brick fireplace was painted white bringing light and a little modernness to the space. 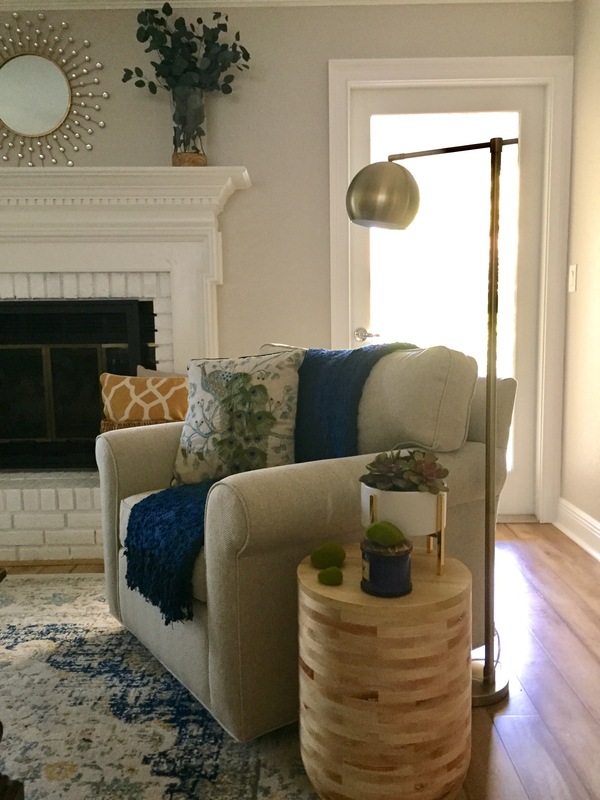 The client love her corner chair, I transformed that simple traditional chair in a cozy and pretty reading corner with a nice light fixture and a cute end table. 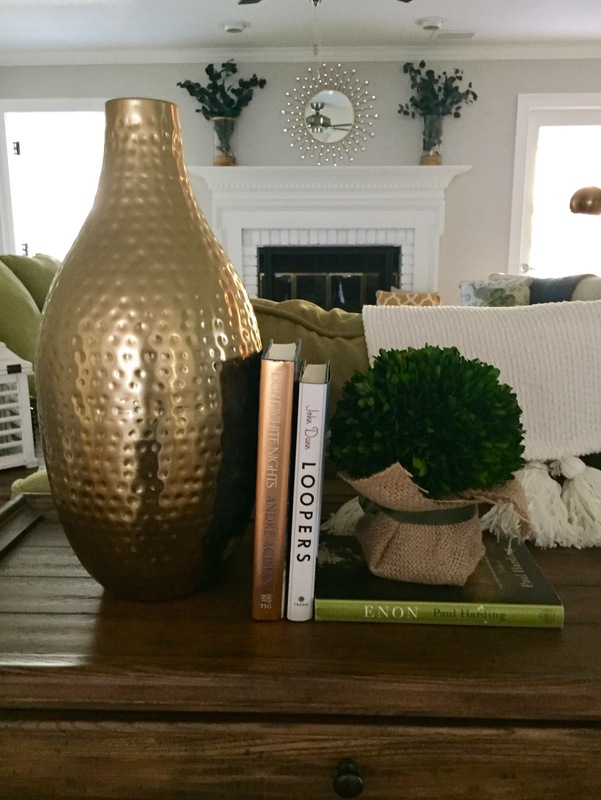 Pops of gold/brass and blue, pillows and throws were exactly what this space was screaming for and I pleasantly gave it to it. This house touched my heart and I’ll be forever grateful for the opportunity. First times are always tough but definitely the most rewarding ones. Thank you Janet! I put all my heart into this work. 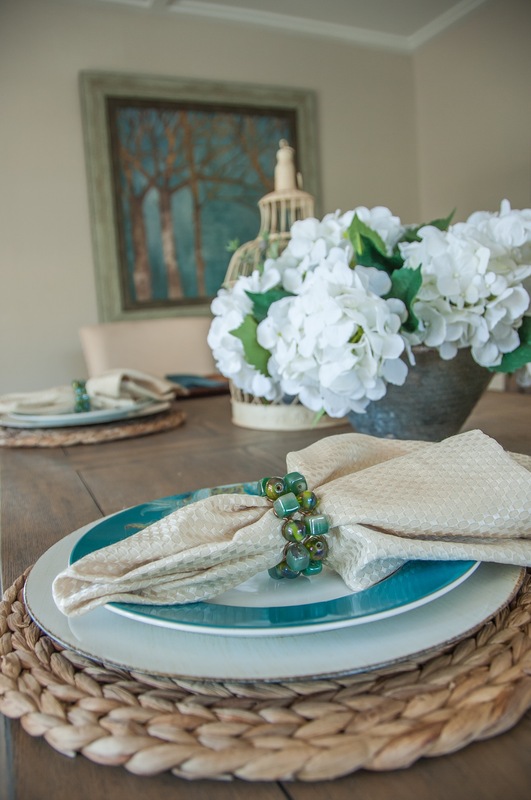 The house looks really beautiful, a fabulous family home! Thank you! It really does. My clients are extremely satisfied.